In addition to welcoming the 9 newcomers to parkrun today, (one of whom was named Usain Bolt! ), we also welcomed Alfie Gower who started his D of E bronze award programme. We hope he enjoys the next 12 weeks with Hazelwood. 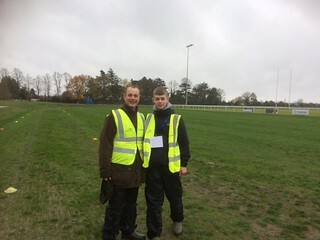 Alfie is shown below on the left with Sue Rix, another of today' marshals. Ian Hammett of Bedford AC Harriers was the first male finisher in a very good time of 17:45. Ian also had the highest age grade result of 76.90%. The first female finisher was Tanya Snook of Shepperton Running Group in a time of 22:25. Well done to both. Another notable achievement was that of Angela Gibbins who gained three new PB's in 3 consecutive visits to Hazelwood. Congratulations Angela and keep up the good work. 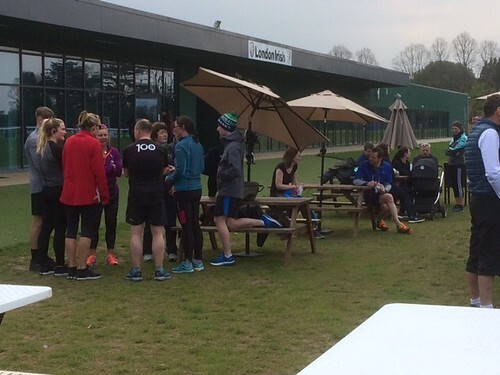 Following the run, all our participants, whether runner or supporter were able to take advantage of teas and coffees outside the clubhouse. Hazelwood held its first pacer event this week. We hope you enjoyed the opportunity to challenge yourself to achieve new personal bests. If you did, then congratulations. If not, then well done for trying and you can look forward to next months pace event which will be run using odd minutes 21,23,25 .... etc. We will be looking for volunteers to act as pacers so watch out for the call. 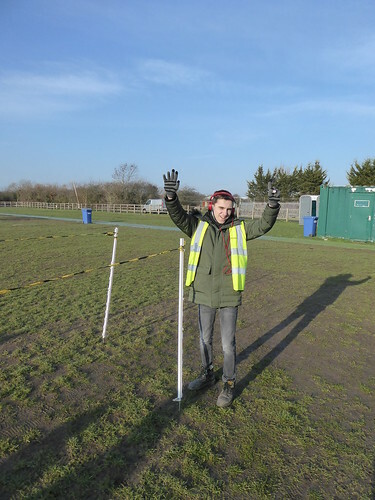 This week, we also bade farewell to Callum Stewart, who has now achieved his bronze DofE award by volunteering at Hazelwood over the past 12 weeks. You will have seen him act as Run Director last weekend and a fine job he made of it. The picture below is of Callum being introduced to the finer arts of RD'ing by Steve Barrington. 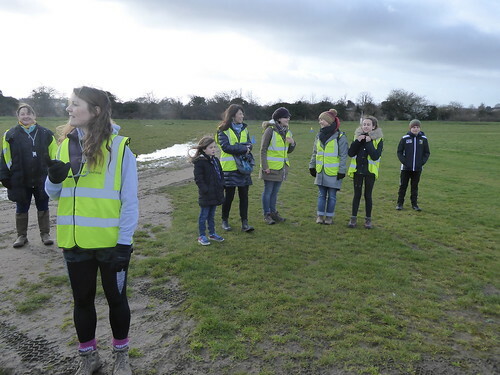 This week 150 people ran, jogged or walked the course, of whom 35 were first timers or visitors to Hazelwood. Of these, 6 were complete newcomers to parkrun. Welcome to all and we look forward to seeing them again at Hazelwood. 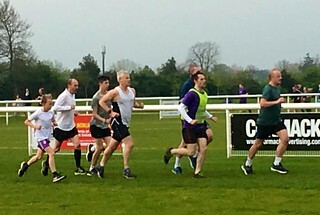 The pacer event must have had a good effect as 29 participants recorded new Personal Bests. Representatives of 11 different clubs took part including Parc Bryn Bach Running Club in Gwent and Stubbington Runners, based on the Solent. Also participating today was Raju Mazunder, running for the group "parkrun for people living with asthma". More information about the group can found online. 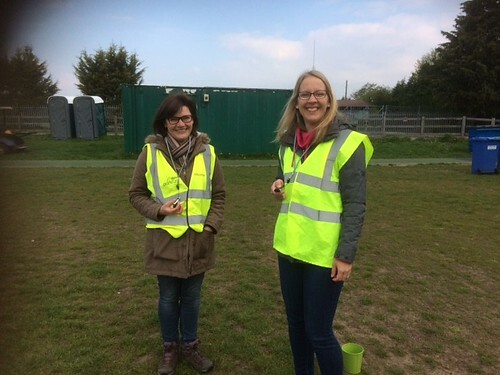 Well done to Sonia Bosher as she took part in her 50th parkrun and also to Lyzanne Warner, a visitor who completed her 100th event at Hazelwood. The first male finisher was Johnathan Mainwaring in a time (and new personal PB) of 19:38. Johnathan also achieved the highest age grade result of 78.27%. The first female finisher was Sophie Lee in a time of 23:55. Congratulations to both. Please consider volunteering. Its great fun. Just have a look at the future roster on our website or, if you have opted in to receive our emails, just respond to that stating what role you would like to do. Finally, many of you will know Dorothy McLennen, our most senior female runner. Over the past week she has been in Poland at the World Masters Athletics Championships indoor competing for Ireland in the pentathlon. Just goes to show that keeping fit can be for everybody at all stages in their lives. Well done Dorothy. 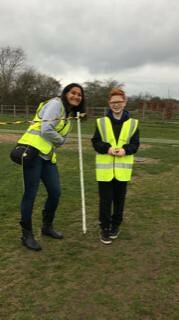 Once again, this weeks run report was written by our Duke of Edinburgh bronze award student, Mila Wolfenden. 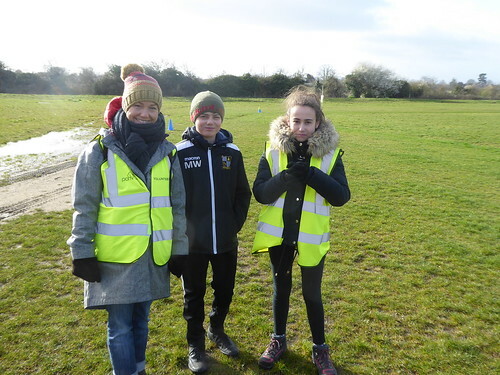 We had a really nice warm welcome to our 55th Hazelwood Parkrun with balmy highs of 19 degrees which meant the track was becoming dryer, laying a good foundation for 34 of our park runners achieving new PBs, well done. 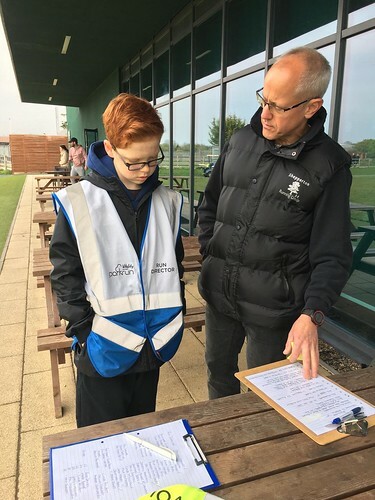 We had 132 people running, jogging and walking the course of whom 20 were first timers and we had visiting representatives from 13 different clubs taking part from areas as far away as Durham and Tadworth. Will Cullen of South London Harriers was the first male finisher with the time of 18:03; his PB stays at 16:46. And a big congratulations goes out to Freya Bosher who was our first female finisher with a new PB of 23:47! Mike Dennison, who came second with a time of 20:19 and achieved the best age grade result of 79.66%. As an aside, we are delighted to be able to report that the Sunbury Health Centre has agreed to become a parkrun practice. 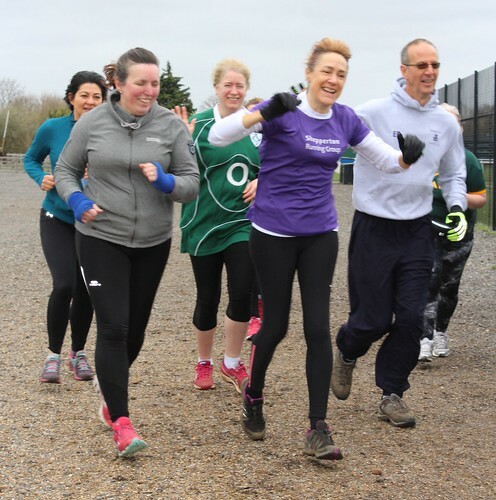 This means that parkrun information will be advertised within the practice, and, where appropriate, patients, carers and staff will be encouraged to join parkrun to improve their health and well being, reducing the need for lifelong medication. We look forward to working with SHC over the coming months and welcome them to the Hazelwood parkrun community. 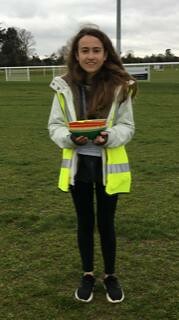 This weeks run report was written by our Duke of Edinburgh bronze award student, Mila Wolfenden. A welcome change to the weather with highs of 10 degrees, a nice break from the wind and cold of last week! 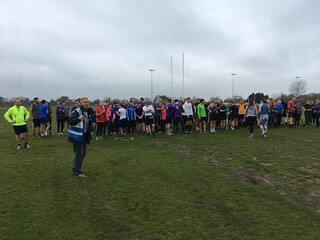 Today was the 54th Hazelwood Parkrun and 112 people ran, jogged or walked, with 21 first timers, 29 new personal best records (congratulations) and Parkrun visitors from Guildford, Nonsuch Park, Alton, Southampton and the furthest was Bristol Orienteering Club that made a total of 13 different clubs taking part in this event. PS. 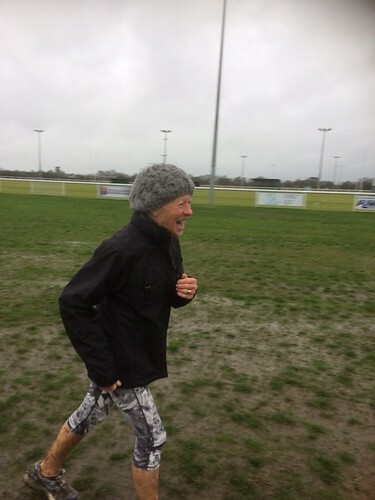 Good luck to our most senior lady runner, the amazing Dorothy Mclennan, (marshalling on the gates last weekend) who was flying to Poland to compete in the European championships! What a lady and what a competitor. Today was the first anniversary of Hazelwood park run and was off to a very windy start, but at least no snow as per last years first event! 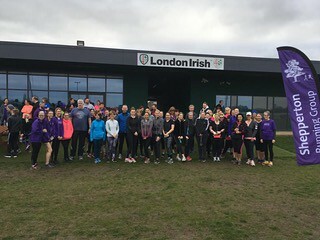 However this did not dampen the spirits of the runners who turned up as ready as ever, 150 in total, 25 of which were first time runners.16 representatives from other clubs also took part; including visitors from Osterley, Gunnersbury, Northampton, and Swindon. An amazing 30 members of Shepperton Running Group also took part- many were graduates from their recent C25K course. Great to see they have stuck with it. You will notice that today we welcomed Paul Freyne, who has completed 502 events and is the owner of a (rare) sky blue t-shirt. An incredible achievement and is I am sure, a proud member of the exclusive 500+ group of parkrunners. A special vote of thanks go to Hollyanne, Claire, and Nicola for making such delicious cakes to help celebrate our first anniversary; and thanks to the Hazelwood Centre for permitting us to host these parkruns for the past year. 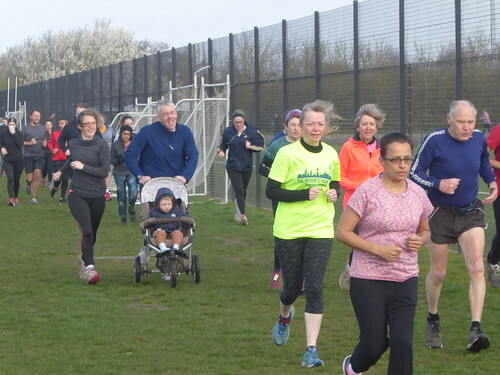 Hazelwood parkrun started on 17th March 2018. Since then 1,896 participants have completed 6,335 parkruns covering a total distance of 31,675 km, including 1,285 new Personal Bests. A total of 180 individuals have volunteered 833 times. 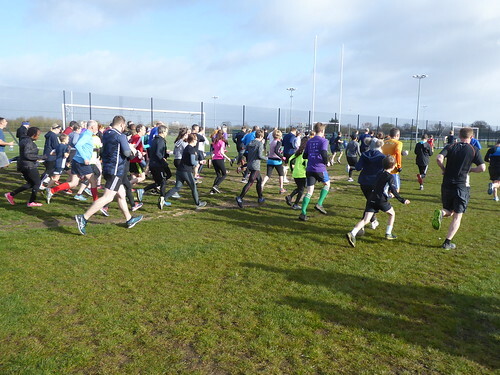 The run report for the event held on 9th March was written by our young D of E student Callum Stewart. He appears in the photo below. We hope you enjoy it. On a cold but crisp day, 118 participants ran, jogged or walked the 5-kilometre course at Hazelwood. 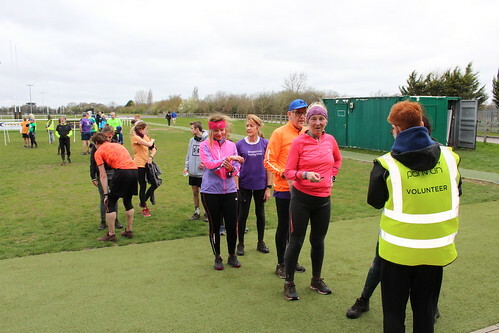 Runners safely navigated the wet and muddy back field, and everyone safely got round with no injuries or slip ups. There were 27 runners that were new to Hazelwood and an astonishing 15 new PBs. We had people from 12 different athletic clubs and organisations take part in the race too. The first male finisher was Nathan Reeves with a time of 19:23 and he’s only in the 11-14 age category while Julie Barclay was the first female finisher with a time of 23:49. Steve BARRINGTON. Andrea CAVALHEIRO. John MAXEN. Callum STEWART. Matthew SARTIN. Phil WIGGLESWORTH. Jennifer PORTCH. Clair PHILPOTT. Adrian DAVIS. Eddie JONES. Mathilde RIOU. Uday PATEL. Kelly KOTHARY. Helen SHAFFELBURG. Mila WOLFENDEN. Their encouraging words and support ensured a successful event was had by all. Next week will be the first anniversary of Hazelwood parkrun and we hope that there will be a bumper turn-out. 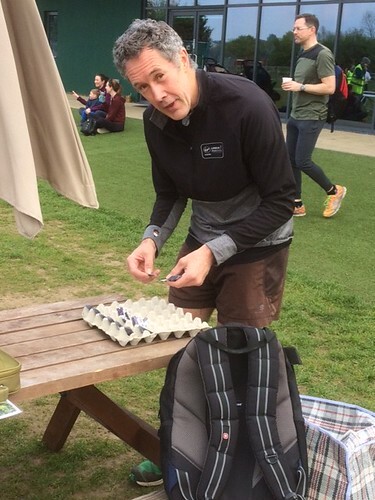 There are some weeks and events of the parkrun year that are always a little more special. The Santa run at Christmas is one, the New Year double is another. For Hazelwood, one of our annual highlights is the Shepperton Running Group C25K graduation day. 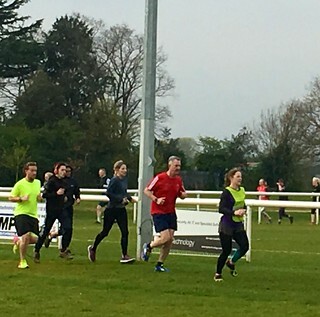 This is when the athletes that have trained with SRG over the past 8 weeks to run 5km have completed their course and can now run their first "official" parkrun. This year, an amazing 37 people of all ages and abilities took part today.They all have our heartiest congratulations and we hope to see them at many future Hazelwood events. We also had a couple of anniversaries to celebrate. Freya Bosher completed her 50th run and Simon Lovegrove completed his 300th. Well done to both. The first male finisher was Donnchadh O'Sullivan in a time of 20:32 and the first female finisher was Tanya Snook of Shepperton Running Group in a time of 20:49. The best age grade result was that of Luciano Cacciolo who achieved a figure of 71.96%. 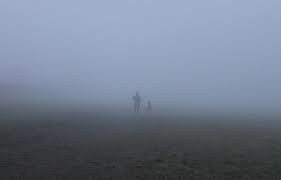 A crisp but foggy morning greeted this weeks 114 participants that ran, jogged or walked the course. The lack of rain over the past raised hopes of a somewhat drier back field than of late, but alas and also too late, your scribe discovered that wearing new, bright white running socks were probably the wrong thing to wear! We welcomed guests from far and wide today, the furthest being Lucy Ross, a visitor from Kinross, Perthshire. 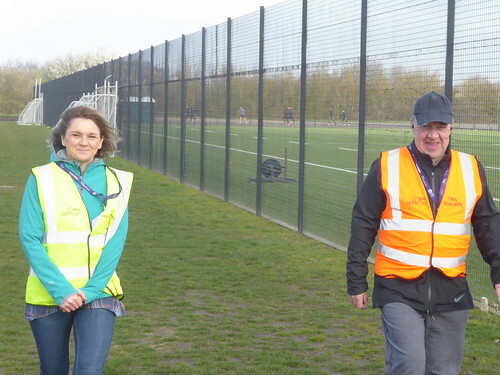 Parkrun tourists from Harlow, Tring, Chigwell and SE London also took part. Four participants new to parkrun took part. Welcome Amanda Cane, Jess Bray, Kirsty Lunn, Joanna Viney and Daniel Koppens. We hope they enjoyed the experience and will be regular visitors. 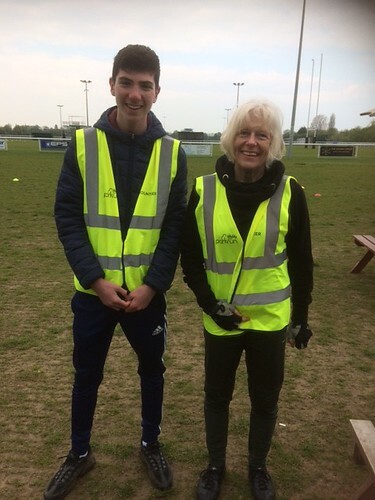 The first male finisher was Eoin O Sullivan who crossed the line in 19:16, and the first female finisher was Merilyn Davis of Elmbridge RRC, crossing the line in a time of 25:09. Merilyn also achieved the top age grade result of 76.08%. Well done all. We now reach over 85 people in our weekly emails. You too could be added to the list. Just opt in to receive our emails via your parkrun profile page. Having this support makes all the difference. Today we also bade farewell to Benji Duncan, who completed his bronze DofE award. I am sure he enjoyed the experience with us, and with the range of roles that was asked of him, will provide him with new skills going forward. See you next week folks. 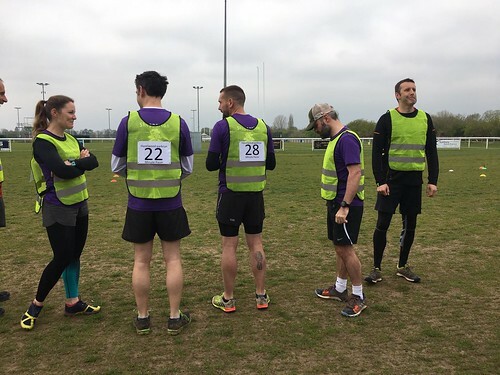 It could be a busy one as we welcome the graduates from Shepperton Running Group's most recent couch to 5km course that took place at Hazelwood over the last 8 weeks. 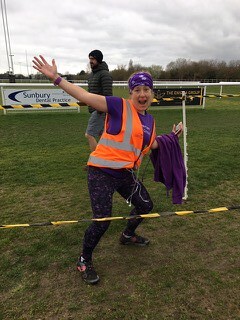 The run report today was kindly written by Laura Stevens, a visitor from one of our neighbour events, Crane Park. 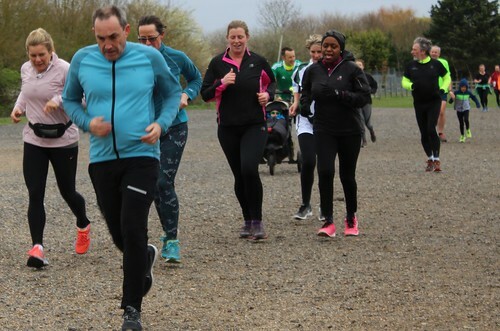 The slightly warmer weather this week brought a healthy field of 109 runners to Hazelwood parkrun, all whom completed the 5km slightly soggy course. The field today comprised of 17 first timers to Hazelwood, 4 of which were running their first ever parkrun, congrats to Simon Koppens, Patti Rogers, Adam Watford & Ava Kelly-Happs, and 7 new PB’s we recorded. I myself was a first-time tourist to Hazelwood and I have to say they’re a very friendly bunch. All very welcoming and wonderful to talk to. First male finisher this week was Paul R Williams in a speedy time of 20:36, and our first lady finisher was Fiona Davis in a spectacular time of 25:19. I do enjoy looking through times for aesthetically pleasing numbers so two special shout outs to David Gladstone who finished in a beautiful 23:23 in 18th place, and to Anna-Lise Christmas who finished in 32:23 in 84th place. Hazelwood will be celebrating their 1st years birthday very soon, fingers crossed we’ll be back then, if not that weekend then soon, a lovely course, lovely people one not to be missed! 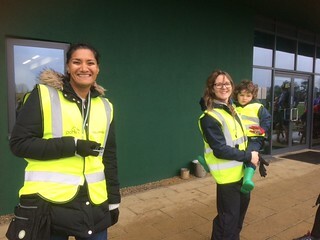 On a cold and very blustery day, 70 people bravely faced the winds caused by storm Erik and safely ran, jogged and walked round the 5 kilometre course. Runners safely navigated a large water feature which was the result of a week’s worth of heavy rain. Eight of these runners were first timers and we hope to see them back next week. Four people achieved new PBs and representatives of 6 different clubs took part this Saturday. We look forward to their return visits. The first male finisher was Mark Cobley with a time of 22:03, only a minute off his PB and completing his 175th Parkrun. Mark Cobley also had the highest age related score of 64.32%. The first female finisher was Rebecca Lennon with a time of 25:59. Steve BARRINGTON. Rina VYAS. Robert LOVEGROVE. Alison JOYCE. Wendy HAPPS. Paul HAPPS. Helen KYLE. Andrea CAVLHEIRO. David ALLEN. John MAXEN. Callum STEWART. Matthew SARTIN. Charlie CAREY. Clair MELEDY. John WILKINSON. Dorothy Agness MCLENNAN. Benji DUNCAN. 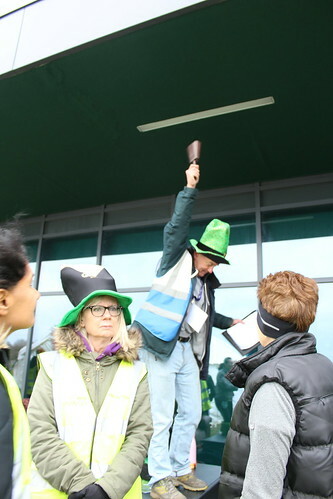 Their encouraging words and support for our wind battered runners once again ensured a successful event was had by all. 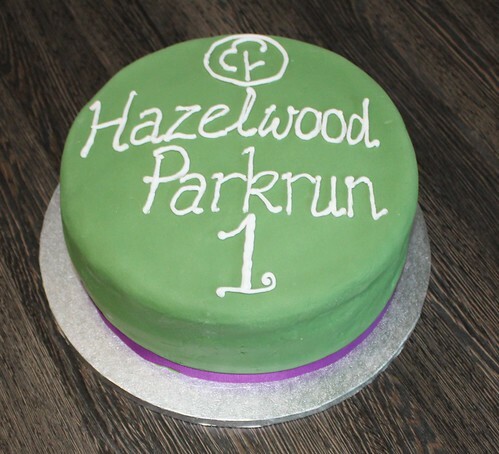 There are only four weeks left till the much anticipated Hazelwood Parkrun’s first anniversary.